This 4-piece from Brighton dish out a range of sounds that are somehow both entrancing and uncompromising at the same time. This is no more apparent than on the last track ‘The Leeches, The Fakers’ where the climax of the song is so unnerving that it has a rather pungent sense of foreboding clinging to it. The rumbling bass line and the relentless drum loops cleverly play out here. 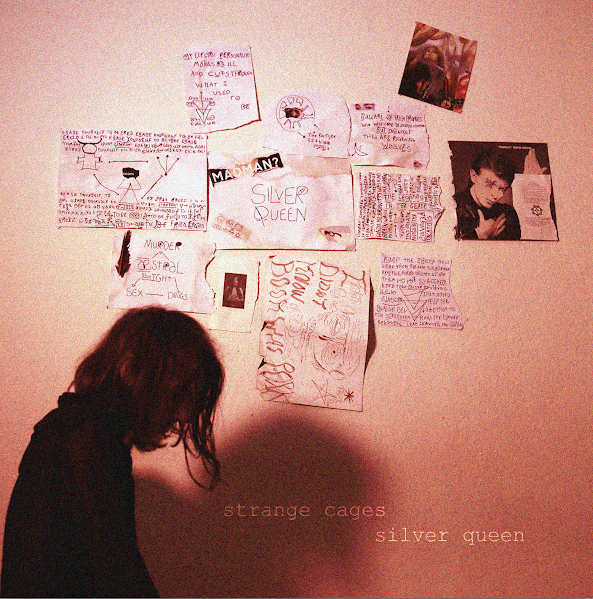 This description is Strange Cages’ EP Silver Queen served up on a plate – a recording where the senses feel like they’re gradually becoming cross-wired and the band’s deranged dynamics draw you in, whilst at the same time unnerve you with its tense and volatile musical lacerations. The singer’s hollering and howling on ‘Lasers of Joy’ is uninhibited whilst the arrangements of the track are more restrained and this enables for a pleasing contrast to play out with a gentle hypnotic pulse. The intro on ‘False Prophet, Death Waltz’ is a different beast altogether, with sporadic explosions of distortion and plenty of tense and spun out anger exerted in fine punky anarchic fashion. ‘Sick with Desire’ feels like it will implode with its menacing bass and shuffling drum beats and intense vocal delivery. Another highlight on here. ‘Silver (Mastered & Final)’ is the band’s attempt of a ballad amongst the unflinching punk theatrics. Although this track has a panoramic feel to it – to me it was eerily reminiscent of the beginning to David Bowie’s much-touted classic Space Oddity. As a whole, Silver Queen possesses an almost macabre-like atmosphere throughout. It is designed to discomfort but also to enthral the listener in equal measure. It wants you to sit up and take notice and be drawn into this fictional deranged cult leader whom the singer preaches about throughout the EP. Strange Cages are seeking to leave an impression on you and their refreshing and gloriously disorientating Silver Queen EP is definitely an indication that this will remain the case for some time to come. They are playing live at the legendary 100 club venue next month in London – if you want to catch their creation of quirky and murky drenched freak-out punk, then there’s your chance to do so.